Update: This closed on Monday 9 December 2008. I love giveaways and I’ve got another one here for you. 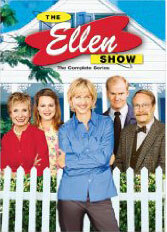 Thanks to EntertainmeTV I’ve got the complete series of The Ellen Show to give away. The Ellen Show’s premise is that Ellen returns to her hometown to accept an achievement award and she discovers her old town hasn’t changed at all. Because of her company in LA collapsing Ellen decides to stay in her hometown. To win this two DVD set, just leave a comment below. This closes next Monday evening at 11.55pm my time. Check out here for your time. The DVDs are for playing on Region 4 DVD players which means these countries: Central America, Oceania, South America, Mexico, Australia, New Zealand but my understanding is that some DVD players are region free. What I’m saying in, is you enter and you’re from another country I can’t guarantee the DVDs will work for you (provided you win of course). Keep an eye out over the next couple of weeks for more DVD giveaways. Maybe after you’ve left your comment to enter you can go checkout EntertainMe’s competitions. Wow what a great prize Jenn – I love giveaways ! Ps It must be frustrating not to be able to win them yourself. Oh, I think I need some smiles – so long as it isn’t “The Ellen Show” as in her very pathetic Letterman/Oprah wannabe stuff. I chose Dr Phil over that even when Dr Phil is pathetic. Well, okay, I chose turning the TV off over Ellen doing that stupid dance. But Ellen doing standup or Ellen doing sitcom – that is far more her genre. I have a region-free player, so I’d be all set! I only caught some of the Ellen shows so this DVD would provide me with some great Christmas viewing. I am also looking for something to view with my youngest – he loves his TV viewing, especially sitcom and this is one way I can spend some time with him now he has grown out of a lot of the other activities we could do together. If you can’t beat em join em.